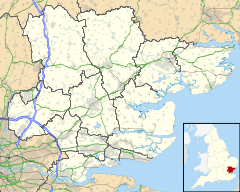 Orsett is a village and ecclesiastical parish located within Thurrock unitary district in Essex, England, situated around 5 km north-east of Grays. It has historically been a primarily agricultural community situated at the southern edge of the old ice age flood plain traversed by the river Mardyke. Orsett contains a ring and bailey earthwork known locally as Bishop Bonner's palace. On the gravel terrace, there is a neolithic causewayed enclosure discovered as a result of crop marks which showed on aerial photographs taken by Dr St Joseph of Cambridge University. It has three concentric ditches with a number of breaks or causeways. The enclosure was used as a burial ground by the Saxons and contained at least three barrows visible on the aerial photo. Orsett Heath in the south of the parish was formerly part of an extensive area of heathland that included Terrel's Heath. The centre of Orsett is aligned on an east–west axis along the High Road, on which is the parish church of St Giles and All Saints along with the animal pound and lock-up opposite Rowley Road. Its former workhouse on Rowley Road was developed into a large modern hospital in the 1960s but has, since the 1980s, been reduced in size once again. Most of the former shops in the High Road, including the Post Office opposite the Church and the blacksmith's in Rowley Road, have closed to be replaced by just one convenience store which contains a sub post office. Two public houses have survived in the centre of the village, one being the prize-winning Whitmore Arms, the other the Foxhound, and outside the village centre Orsett has one additional pub – The Kings Arms. The village's primary school has been located since the mid-19th century in School Lane, educating children up to the age of 14 until 1944 and to 11 thereafter. Apart from some small-scale Council housing in Ridgewell Avenue to the North of the High Street, there was no significant growth in residential development until 1954–55 when new properties were erected in School Lane. These were followed by further developments on the former site of the Anglican Rectory (known as Herga Hyll following its sale), off Rectory and Conways Roads and off Rowley Road. During the late 1980s and throughout the 1990s, a new housing estate was built on land that belonged to the old container site, and some of the ex-military Orsett Camp site, between Stanford Road and Orsett Golf Course. This estate is commonly known as Bonners (after Bishop Bonner), and contains Whitmore Hall, the 'Home of Orsett Scouts'. Most of the former hospital site has been re-developed as housing in the last five years. The redevelopment provided 200 houses, despite being within the green belt and avoided the need to provide affordable housing on the site. Opposite the Old Bakery, on the west side of Rectory Road, is Orsett Masonic Hall which is home to Orsett Masonic Lodge. The historic Orsett Hall on Prince Charles's Avenue, the home of the Whitmore family until their estate was sold in the late-1960s, was destroyed by fire in May 2007 but was rebuilt during 2008/09. The exterior design is in keeping with the original Georgian building. It was used for a Help for Heroes charity event on 11 April 2010. Orsett House is an early-eighteenth-century house off the High Street and on the western edge of the village. It has a well-equipped village hall at its western end and a centre for the churches in the High Street. Orsett is home to a very well known cricket club and to two football clubs – HSSC Orsett and Orsett Green FC (one of the oldest clubs in the Thurrock Sunday League). It has one tennis court and a bowling green. Huddersfield midfielder Alex Pritchard was born in Orsett. Orsett is part of a ward that also contains Bulphan Horndon-on-the-Hill and Lower-Dunton. Politically, it has traditionally been Conservative. ^ "Thurrock Ward population 2011". Neighbourhood Statistics. Office for National Statistics. Retrieved 5 September 2016. ^ Brown, Nigel; Massey-Ryan, Roger, eds. (2004). The Archaeology of South Essex. Essex County Council. p. 11 and 38. ISBN 1-85281-245-1. Wikimedia Commons has media related to Orsett. This page was last edited on 25 February 2018, at 03:39 (UTC).